When it comes to harvesting beets, you have a few different choices to make. Generally speaking, if you want to eat the tops or roots raw, harvest them sooner. If you're looking to cook the tops or want to maximize the size of the root, you'll want to wait a little longer. 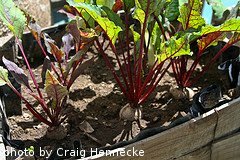 To make pulling the beets out of the ground a little easier, you can wet the soil a little bit with a hose or a sprinkler. This is especially important if you are harvesting larger beets with larger roots. You can also use a knife or stick to help loosen the tap root. If you are going to use the tops, it can be helpful and more efficient to cut them off before watering and pulling up the beet root. We usually take a knife and go down the row, cutting off the tops, leaving a couple of inches worth of stem. You can toss these tops into a bucket or a bowl. By harvesting them first, they stay a lot cleaner and don't have as much grit and dirt on them. After we harvest the tops, we take them inside and rinse them off before putting them in the refrigerator. While cleaning the beet tops, we let the sprinkler run over the beet patch to moisten the soil. Then we come back out and harvest the roots. Grab the top stem with your hands and pull firmly to get the beets out of the ground. If you need to use a stick or knife to pry them loose, go for it, but be careful not to cut into the beet root. After harvesting the roots, just shake off the dirt, but don't wash them yet. 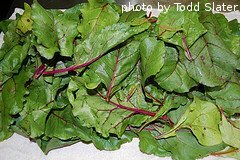 In some milder areas, beets can be left in the ground over the winter. You can harvest the tops first, and then cover the roots with a layer of mulch or straw. This way, the beet roots can be harvested at will over the winter. The key is to make sure the roots don't freeze, otherwise they tend to spoil quickly when they thaw out. When harvesting beets in the fall, they usually get a lot sweeter if you wait until after the first frost. The tops wilt and begin to die off, and the sugars that are in the leaves and stems are transferred to the root. After harvesting the tops, you can eat them raw in a salad, or cook them a little or a lot, depending on what you want. They don't store very well and will usually last just a few days in the refrigerator. The roots will last much longer and can be stored unwashed in the fridge for several weeks. They can also be canned, frozen or pickled. To freeze beets, they need to be cooked first. Cut off the stems and tap root and boil whole with the skins on until they are fork-tender. Peel the skins off by rubbing them with your hands. 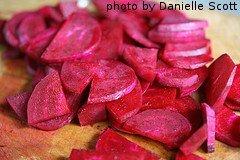 Cut larger beets into 1/4" slices and leave small beets whole. Place them on a single layer on a baking tray and put them in the freezer. Once frozen, you can store them in airtight bags. 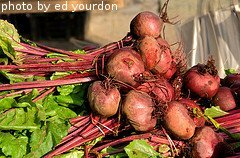 Beets will also last for several months in a root cellar. Trim the stems and leave the tap root attached. Pack them in a crate with sand, alternating between single layers of beets and layers of sand. Check periodically for spoilage. Now that you're done harvesting beets, it's time for a few of our favorite beet recipes.